This lab is geared towards understanding some of the basic concepts in OSPF. Like most of my labs, it will be geared towards the ISP industry. Be sure to also view the “OSPF Basic Concept” labs to get a more complete understanding of the basic concepts involved with OSPF. This lab is intended to built out with MikroTik routers using Ethernet cables to simulate transparently bridged wireless links between towers. 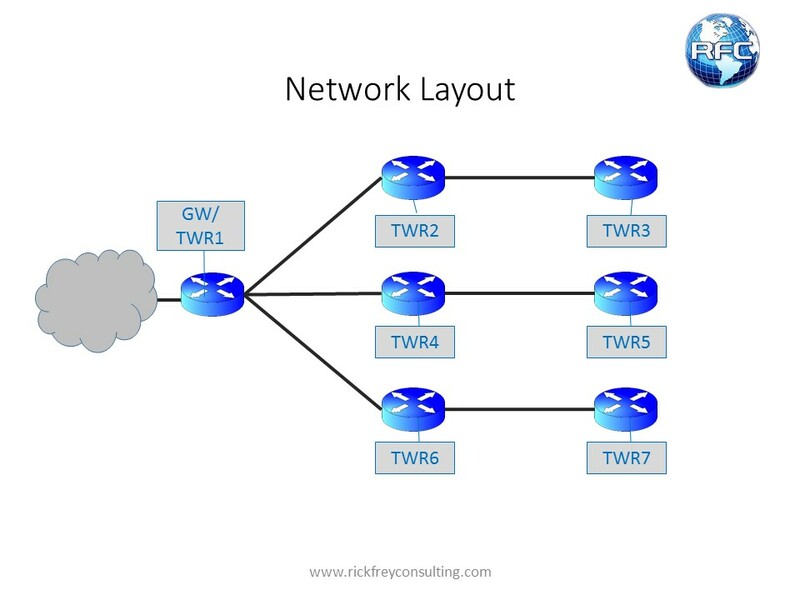 GNS3 and/ or Cloud Hosted Routers can also be used. 1) Down: The state down represents the initial state of a conversation when no information has been exchanged between routers with the Hello Protocol. 2) Attempt: The Attempt state is similar to the Down state, except that a router is trying to establish a conversation with another router and has not received any Hello packets. This is only used on NBMA networks. If the router hangs on Attempt, double check the NBMA settings on both sides for a fat-finger mistake. If that doesn’t work, try disabling and re-enabling the interface. If this problems persists, it may be necessary to script the fixes. 3) Init: The Init state indicates that a Hello packet has been received from a neighbor, but the router has not established a two-way conversation. 4) 2-Way: The 2-Way state indicates the establishment of a bidirectional conversation between two routers. This state immediately precedes the establishment of adjacency. The Hello protocol was successful. This is the lowest state of a router that may be considered as a Designated Router. 5) ExStart: The ExStart state is the first step of adjacency of two routers. 6) Exchange: In the Exchange state, a router is sending its link state database information (Database Description packets) to the adjacent neighbor. At this state, a router is capable of exchanging all OSPF routing protocol packets. 7) Loading: In the Loading state, a router requests the most recent Link-state advertisements (LSA Update packets) from its neighbor discovered in the previous state. 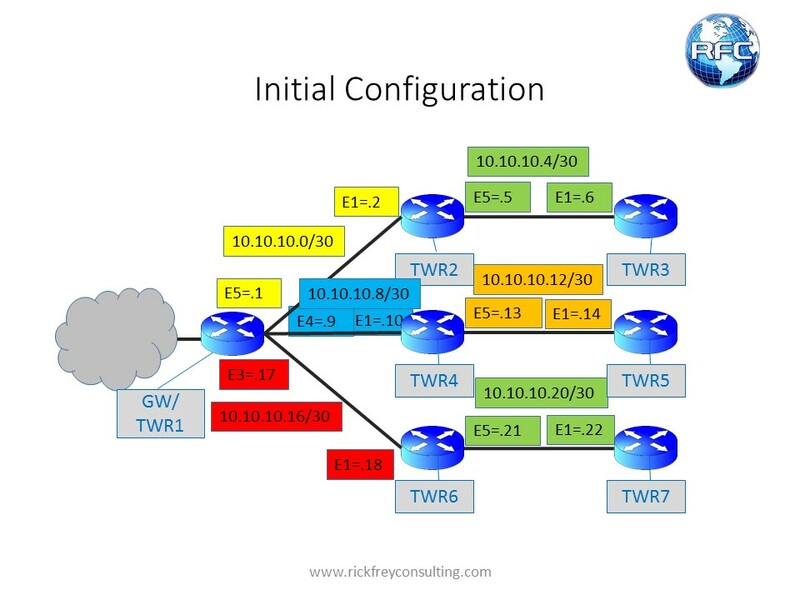 8) Full: The Full state concludes the conversation when the routers are fully adjacent (all LSA Update packets have been acknowledged), and the state appears in all router and network LSAs. The link state databases of the neighbors are fully synchronized. Notes on Neighbor States: You won’t always see all of the neighbor states. PTP and PTMP network types usually exchange all the information very quickly. 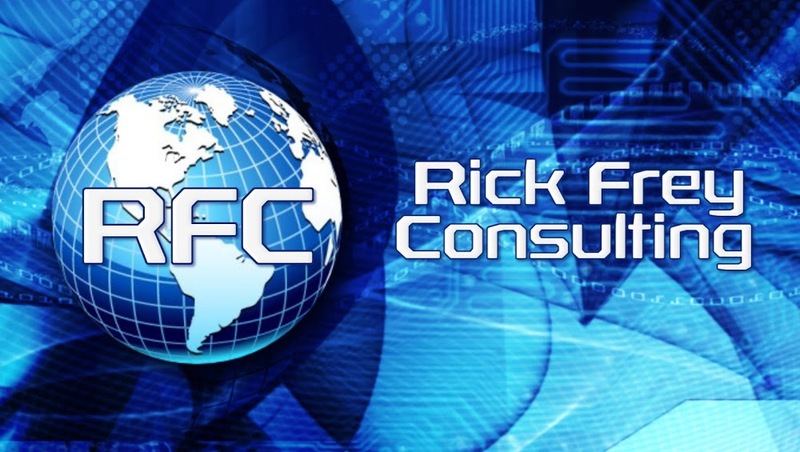 Unless the database is very large, you will see it go directly to Full. Broadcast and NBMA network types are much slower and you are more likely to see them going through each of the states. If you are in Winbox and you don’t see the Neighbor States, right click in an empty area and choose Show Columns and then State. Border Routers: These are routers that have an interface to the backbone area. This includes all routers that interface to more than one area (i.e., area border routers). However, backbone routers do not have to be area border routers. Routers with all interfaces connecting to the backbone area are supported. Internal Routers: A router with all directly connected networks belonging to the same area. These routers run a single copy of the basic routing algorithm. Area Border Routers: A router that attaches to multiple areas. Area border routers run multiple copies of the basic algorithm, one copy for each attached area. Area border routers condense the topological information of their attached areas for distribution to the backbone. The backbone in turn distributes the information to the other areas. 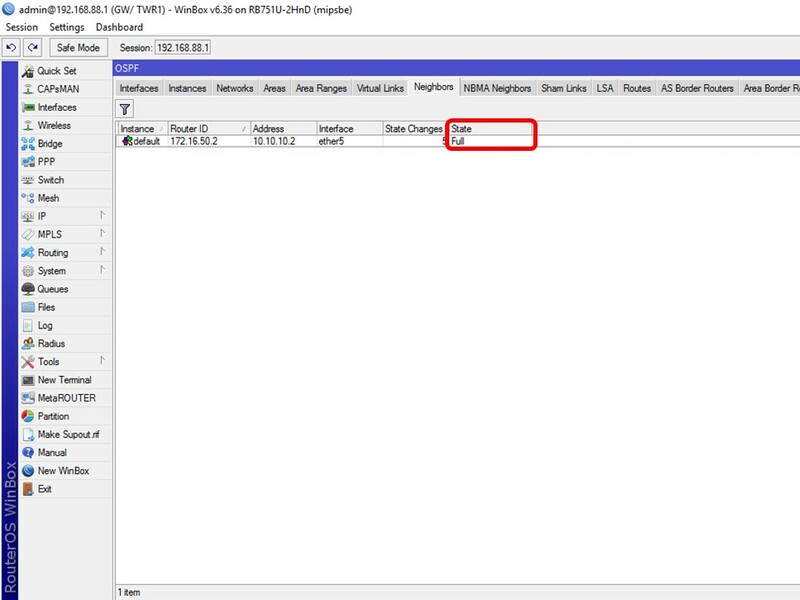 A MikroTik router will see a router as an ABR anytime a router is on the boundary between two areas, but is not an ASBR. AS Boundary Routers: A router that exchanges routing information with routers belonging to other Autonomous Systems. Such a router advertises AS external routing information throughout the Autonomous System. The paths to each AS boundary router are known by every router in the AS. This classification is completely independent of the previous classifications: AS boundary routers may be internal or area border routers, and may or may not participate in the backbone. MikroTik routers will see a router as an ASBR any time an external route is being learned. 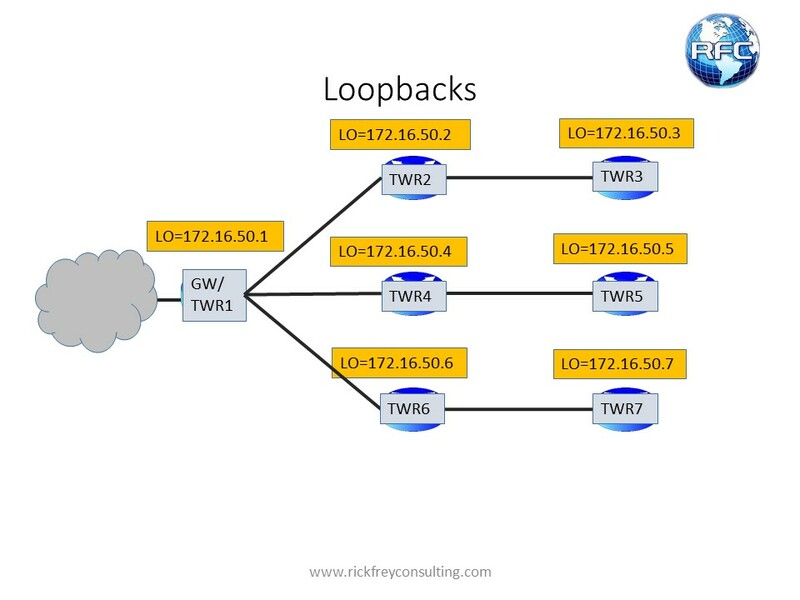 The external route my be a default route out to the Internet that OSPF learned through “Redistribute Connected Routes” or “Redistribute Default Routes” settings or it may be a route from another routing protocol that OSPF is redistributing.